This amazing three-day set is now in stock at just £75.00 (full price £99.00) including FREE worldwide shipping. All the attendants raved about this incredible three days back in August 2008. Learn the causes behind diseases and then use EFT and Matrix Reimprinting to get resolution for yourself or your clients. 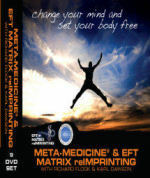 If there was a marriage made in heaven between two health disciplines, META-Medicine® and EFT Matrix Reimprinting is it. META-Medicine® is NOT a therapy but an amazing diagnostic system that allows you to determine the specific event that causes an illness. META-Medicine® was developed by medical doctors and health practitioners worldwide and through the use of modern CT imaging it has mapped the trapped emotional conflicts that get stuck in the brain and specific organs to their original stressful cause. Finally it answers how and why certain symptoms are there, what caused them; why do specific organs and the brain uniquely react to certain stressful events. Using META-Medicine® with EFT you can get to these trapped emotional conflicts quicker and with more accuracy than just intuitively chasing the emotion. META-Medicine® works by asking targeted questions in conjunction with brain mapping, the aim is to quickly determine the root cause of a client’s illness, diagnose exactly where they are in their disease cycle and as a result design a ‘road map’ so you as the EFT practitioner deliver the right tapping sequence in the right order. You therefore can masterfully assist in relieving pain and symptoms simply and easily by using amazing reframes that actually talk directly to the purpose behind the symptoms. Then get to the root cause of the problem with lightning speed and additionally solve complex chronic issues by knowing what to tap on with your client; reassuringly knowing where, when and why you are tapping at that point. As an EFT practitioner META-Medicine® gets you right to the cause of your client’s issue, making your work even more accurate, allowing you to get deep into the psychology and biology behind the disease and therefore you to achieve even better results. Unlike other diagnostic systems, META-Medicine® does not require guesswork, intuition or a leap of faith to determine the root cause of a disease. See lots of demonstrations and plenty of practical applications and exercises plus lots, lots more.